- Capacity : 5 tonnes*. Hydraulic PressAvail superior quality hydraulic press made in brass from us.The device is used to generate enormous lifting force.All the components of the press are quality tested. A Borosilicate glass working model, with visible coloured valves of 225 mm height and 120mm width, mounted on wooden stand 285mm height with perspex trough. Exp-1 To study the principle of Hydraulic press. Exp-2 Transmission of fluid pressure.PHYSICS, Class Xl, Part-2, Chapter-10, Mechanical Properties of fluids. This Pascal's Law Demonstration Hydraulic Press is a Great way to Show Pascal's Law in Opera[tion. Student will understand mechanical advantage when they use this system of connected pistons. Apply force to one syringe-type piston to make the liquid rise in other, recreating the concept behind such every day items as power steering, shock absorbers, and hydraulic jacks. Our auto tube press are high quality, heavy duty machines capable to work round the clock and produce different kinds of tubes. 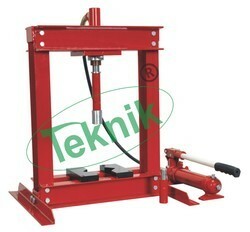 The machine makes very low noise because of the hydraulic power pads being used. It has cartridge valve for a very smooth change over of valves. 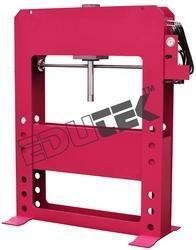 This machine is available in different load bearing capacities. heavy, two cylinders of 40 mm & 15 mm diam. With pistons fitted with non-return valves, worked by a hand lever, a stopcock at bottom of the smaller cylinder, removable loading platform, strong construction.